PEOPLE are normally horrified to find bugs in their food — but not Skye Blackburn, who has turned the growing foodie trend into a successful business. Ms Blackburn owns the Edible Bug Shop in Greystanes, breeding insects specifically for human consumption. Her products range from roasted crickets and cockroaches to chocolate-coated worms. 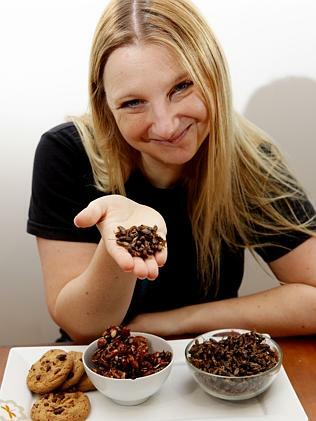 The entomologist supplies 15 restaurants across Australia with edible bugs, and hopped into national attention when she appeared on an episode of the Channel 10 show Shark Tank last year. Ms Blackburn said people were still coming to terms with the idea of bugs as food. “One reaction we get is ‘oh my God, that’s disgusting’,” she said. “But people are pleasantly surprised when they try it. Ms Blackburn started the company after completing a degree in entomology as well as food science at university. She hopes that by educating people about the way edible insects can be farmed as an eco-friendly alternative to beef or pork, they can become a staple food of the ­future.